CEDAR RAPIDS, Iowa (December 6, 2018)–Syncbak, the leader in live local OTT powering more than 10 million hours of live streaming annually from technology created at its headquarters in Cedar Rapids Iowa, today announced the addition of two more full-time employees from Kirkwood Community College’s Computer Software Development (CSD) Program. This brings the number of employees Syncbak has hired from the program to thirteen. The company’s 24x7x365 network operations team, which handles support for major accounts like CBS All Access, Hulu, Sony and Amazon, is now fully managed and staffed by students and alumni of Kirkwood’s Computer Software Development program. Synergies between Syncbak’s technical staffing needs and the skillset of students coming out of the CSD program began to develop in 2016 when the company was in search of automation technicians. Two candidates from the program fit the bill perfectly, and each time the department grew, or team members moved onto new roles within the company, hiring managers looked to students from the CSD program to fill the void. Thanks to the focus, dedication and mentorship shown by Kirkwood’s professors, students from the program understand what it takes to succeed in demanding high-technology roles. Students come out of the program and are immediately able to add significant value to the work happening at Syncbak. For the first time ever this fall, Syncbak hosted students and staff from the Structured Systems Analysis class at Kirkwood, part of the school’s Computer Software Development program. After a welcome presentation given by Syncbak’s founder & CEO, Jack Perry, the students toured the Cedar Rapids facility, learning about the technology that powers live broadcast streaming for stations in 208 DMAs, reaching 99% of the US population. Pre-interviews were held on-site with official interviews held several days later. The company’s two most recent hires came out of this hosted event. Kirkwood’s Computer Software Development program is geared towards students who are both creative and logical, like working with computers and especially those students who want to learn to produce solutions for businesses like Syncbak. 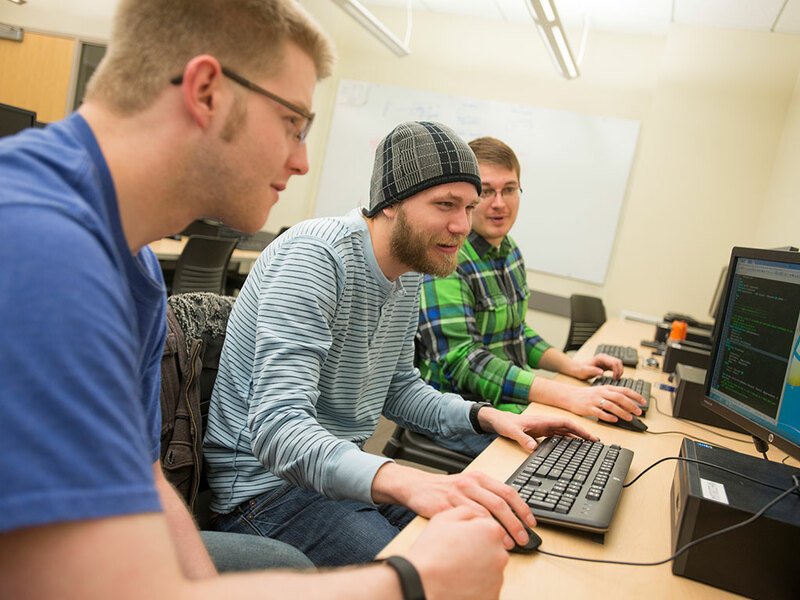 As part of the program, students learn various phases of software development including how to design, write, test and document computer programs with a variety of tools using a variety of languages. Because of the synergies between Kirkwood’s CSD program and Syncbak, the professors at Kirkwood regularly collaborate with the engineering leadership at the company. They learn what skills are most important for the students to be learning and to stay up-to-speed on any changes in the industry. When students graduate, they are ready to make an immediate impact. Syncbak is the leader in OTT solutions, powering more than 10 million hours of live local broadcasts on OTT destinations like CBS All Access, Hulu, fuboTV, Sony, Amazon, the NFL, and more. Syncbak’s end-to-end platform, SimpleSync, is used by broadcasters for live-stream transcoding, cloud-based rights resolution, cloud-based DVR, device filtering, geo-location services, content management, stream monitoring, video clipping and dynamic ad insertion. Syncbak’s technology currently reaches 99 percent of the US population across 208 markets, representing 99 station groups and all major networks, including CBS, ABC, FOX, NBC, and the CW. Syncbak recently expanded its platform with the launch of SBTV. SBTV leverages Syncbak’s industry-leading live stream platform, SimpleSync, and its proprietary live DAI technology, AdSync, to deliver free, hyper-local content to viewers anytime, anywhere. The company was founded in 2009 and has offices in Cedar Rapids, IA and New York, NY.